The outcome of this poll will directly influence the production of this website in 2013. If you use the Carbonite cloud-based backup tool for Mac, you may notice that your computer’s fans are running loud and often, and that the Carbonite daemon is running at 80-120%. This gets really, really annoying after not too long. I’ve dealt with it for two years by pausing backups while I’m working on my computer, hoping that Carbonite would release a new version that fixed the problem soon. That has not happened yet, and I grew tired of trying numerous fixes mentioned around the Internet, only to have the problem continue. 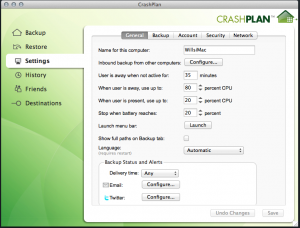 Finally, I saw that someone used a different backup tool called CrashPlan. I am on their 30 day free trial and am really digging it so far. The pricing is at or below that of Carbonite (depending how much space you need) and it seems to be running quite smoothly so far. I really like the extra configuration and security settings that you just don’t get with Carbonite. It allows you to set schedules for CPU and bandwidth usage so that you can maximize your time efficiently. You can even choose what type of encryption you want to use on your stored backups, and if you set a password, your backups will be protected by that as well. There doesn’t seem to be any restriction on file types, either. I remember Carbonite had a thing for a while where they wouldn’t let you back up video files, which just seemed dumb. They might still have that stipulation. I don’t know. It doesn’t matter, because I’m ditching Carbonite for good now. What do you use to back up your system and how well does it work for you? Deep Chatham is a thing? Apparently there is a band called Deep Chatham. Weird. I wonder if they know my nickname in high school was Deep Chatham. Their website is deepchathammusic.com. I have a website called chathammusic.com. Even weirder. In other news, my solo album, Geekamongus, made it onto the Mountain Xpress’s list of 16 Albums We Loved in 2012. Spiffy! 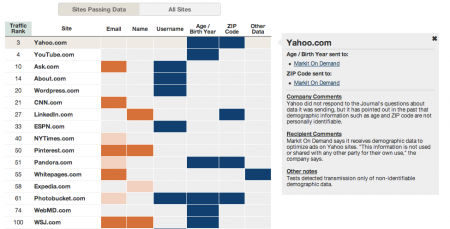 A pretty interesting analysis of major websites and what they do with your personal data. Why would ESPN want to send my username to Adobe? Why is Pinterest sending my name to Google Analytics? I’m interested to see who is bothered by this, or if anything is done about it.